Over the past 15 years, Dr. Richard Goossen and his team have conducted interviews with over 300 Christian entrepreneurs. A selection of over 80 of these interviews are now available on Vyrso. 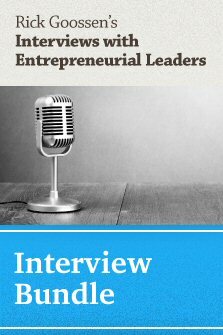 Entrepreneurial Leaders Interviews "Bundle" (20 Interviews) - Are you looking for some entrepreneurial advice? Maybe some inspiration to jumpstart your business? Even some history to give context for what may come? Goossen’s interview bundle is sure to be thought-provoking and informative on the most relevant opportunities and issues facing leaders today. To buy now click here! Entrepreneurial Leaders Individual Interviews - Over 80 individual interviews with Christian entrepreneurial leaders are available on Vyrso. An interview with Ted Bargen (to the left) is highlighted. To view all the available interviews click here!